What is Amazon Music Unlimited and How to Record it? Amazon Music Unlimited is Amazon's fully-fledged music streaming service, offering access to over 40 million songs through the Amazon Music app and Amazon Music for Web. As ever, there’s a 30-day trial on signing up, after which you pay £9.99 per month, as is seemingly law in streaming audio. Sign up for Amazon Music Unlimited: Go to the Amazon Music Unlimited website for the UK or for the US. Where is it available? 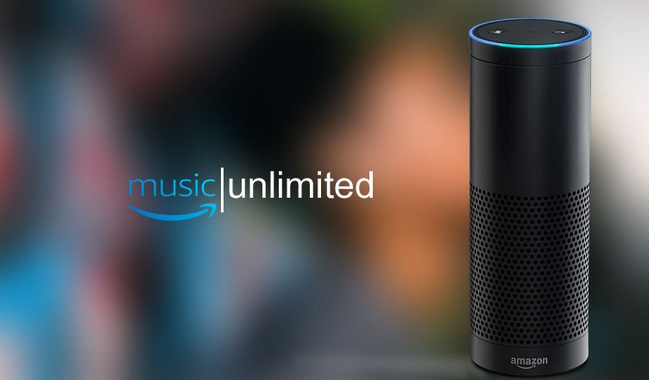 Now, Amazon Music Unlimited is available in the UK, US, Germany and Austria. Price: Amazon Music Unlimited is available to Amazon Prime members for £79 per year in the UK, $79 per year in the US. Alternatively you can pay monthly at a cost of £9.99 per month ( $9.99 in the States). How to Download Amazon Music with the Best Amazon Music Converter or Recorders? Maybe you have ever used the recorder software to keep the music for offline listening. 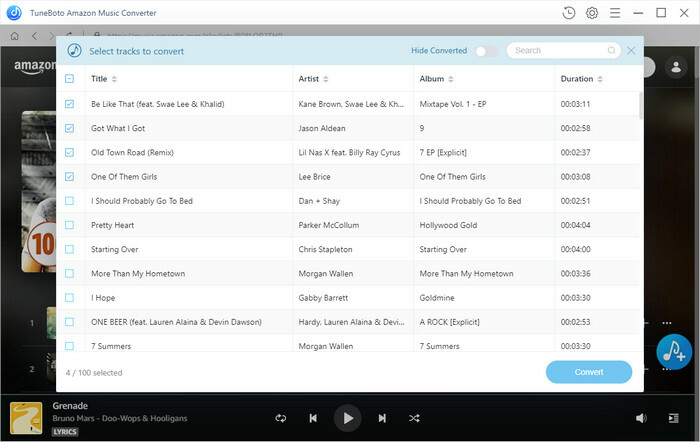 Here we introduce a more professional Amazon Music Converter which is developed to convert Amazon songs, albums and playlists to common MP3/AAC/WAV/FLAC format with excellent output quality, keeping ID3 tags after conversion. Download and install the free trial version on your computer. 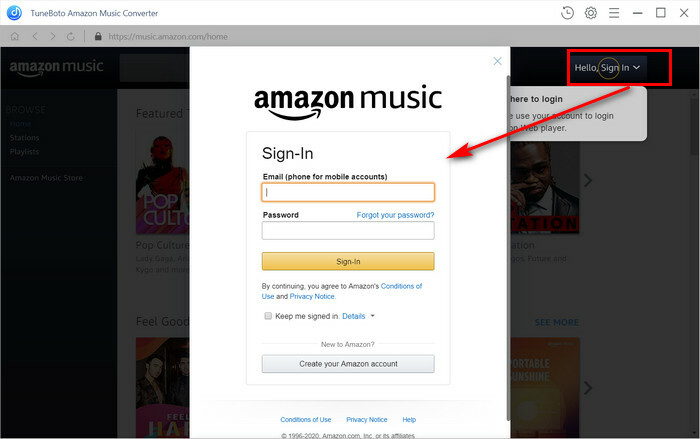 Step 1: Run TunePat Amazon Music Converter on your computer, then log in your Amazon music unlimited account. Please note that TunePat will not take any information out of your account. Step 2: Click on the button on the bottom right corner to customize the output settings: Output Format (Auto/MP3/AAC/FLAC/WAV), Output Quality (256kbps, 192kbps, 128kbps) and Output Path. And you can choose your counrty/region here. Step 3: Open a playlist, artist or album, then click on the button on the bottom and select the songs you want to convert. Step 4: Click on "Convert" button to start converting the Amazon songs to the output format you chosen. After the conversion completed, you can click on icon to find the well converted music from local drive. With the help of this Amazon Music Converter, you can easily get DRM-free Amazon Music, enjoy them with various media players and transfer them to your MP3 players, car players, iPhone and more. 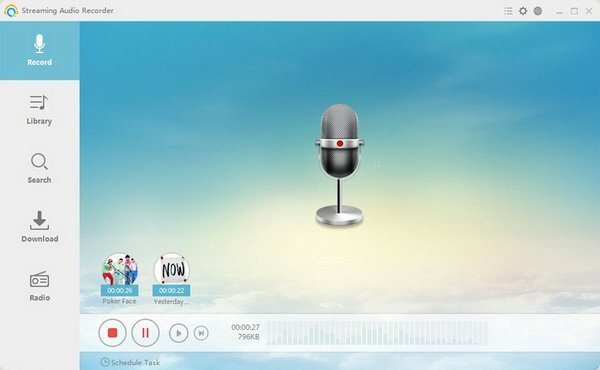 Wondershare Streaming Audio Recorder is a creative audio recording tool, which lets you capture any digital audio source that plays on your laptop or computer. It can retrieve details such as artist, album and genre and then embed it into the music file. 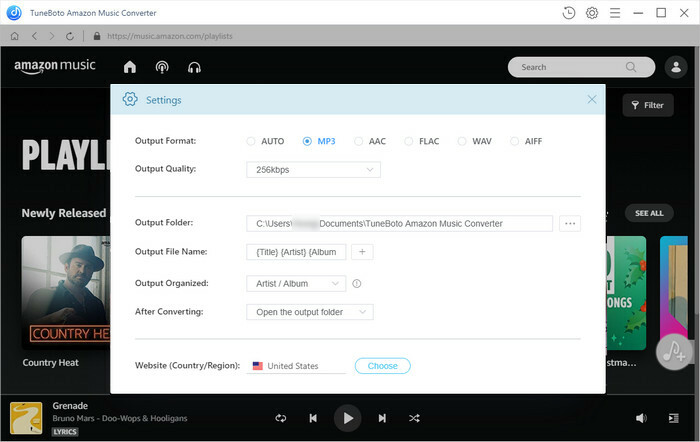 With Wondershare audio recorder, you can capture and download audio from over 500 popular radios and music streaming sites including Amazon Music Prime & Unlimited, Spotify, iTunes radio, BBC radio and much more. 1. Start Wondershare program after it is well-installed. Click the Record button at the upper left corner, and the program will get ready for recording. 2. Now you can play the music files in Amazon Music, and the program will record it. 3. When the music files finishes playing, you can click the Record button again to stop the recording process. Apowersoft Streaming Audio Recorder is a nice tool to record any sound your laptop or computer produces just like the one above. It can also deliver output files in a few formats like AAC, MP3. 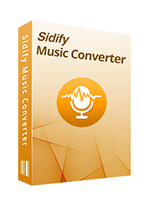 This tool functions not only as a good audio recorder but also offers the purpose of free audio editing tool, CD burner/ripper, and audio converter. However, it restricts its users to have 128 kbps recordings, which is on the low end of acceptable audio quality, and it only lets users record audio up to 3 min and it can only download one track each time. 1. Launch Apowersoft, click "Setting button"> "Record settings" and select "MP3" or other format. 2. Set the "Audio source" as "System sound" to make sure that you can record audio from Amazon music. Then you need to hit "OK" button to save the settings. 3. Hit "Record" button in the lower-left corner, open Amazon music app and play a song on your computer. And click the recording button once more when it is done. 4. The recording process will start. Once done, just stop recording by clicking "Stop" button. Amazon Music Unlimited or Spotify: Which is better?